Whether you are young or old, an experienced modeller or new to the hobby the task of painting your model can spell the difference between satisfaction and frustration. This short article is intended to help you to get the most satisfaction from your efforts. A dust mask or respirator, although not essential for brush painting, is a wise purchase. It is also a good idea to buy a box of latex surgical gloves to wear to minimise the transfer of grease from your fingers or possible toxic dust, paint or fluids onto your skin. These are available from your local D-I-Y or tool shop. As with all good results, time taken at this stage will ensure that the final result is the one intended. These may apply before, during and after assembly. White-metal kits are a special case for which it is advisable to buff each part with a brass suede brush, taking care with the more delicate parts. Plastics and metals, the most common materials used today, may be cleaned using a cream type bathroom cleaner, a stiff bristle brush (old toothbrush) and a nylon scouring pad. Once clean and dry the model may be painted immediately or, if not, it should be temporarily stored in a dust free box. Do not be tempted to paint your model if the temperature or humidity is too high. To give an evenly coloured undercoat. The choice of colour of the primer will affect the tone of the topcoat. Use a light coloured primer for light colours and vice versa. Application of the primer should be just enough to give an even coat without being too thick. I would not advocate brush-painting primer, as it is very difficult to do so without leaving tell tale brush marks. 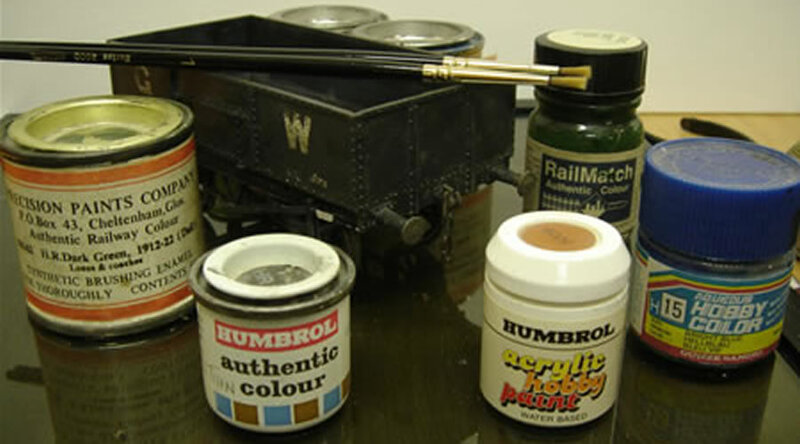 Most colours may be had from model shops or car paint suppliers in aerosol can form and in various finishes. Because some paint types are not compatible, e.g. acrylic and cellulose, you will need to check the type of paint in the can. Follow the maker’s instructions and use several thin coats rather than one thick coat. The final finish should be satin or matt, as a glossy model usually looks anything but real. Try to complete a whole area at once so that there are no joins in the paint coat. Paint a test piece as well to check that the paint has dried without touching the model. It is essential to care for your brushes in order to get the best results every time. Clean a brush by dipping it in brush cleaning fluid (e.g. white spirit) and wiping it on old newspaper, repeating the operation until the majority of the paint has been removed. Give it a final gentle swirl in the cleaning fluid. Take a small amount washing-up liquid or liquid soap and gently work it into the bristles. Pressfix or Methfix transfers, once applied, should be over coated with varnish to fix them permanently in place and prevent damage when the model is handled. If the model has waterslide transfers, it is best to lay them on a glossy surface to minimise the visibility of the carrier film. To do this either paint the whole model or just the transfer area with gloss apply the transfer (decal) and finish with a satin or matt varnish to fix them in place. These are just a few of the hints, tips and tricks of the trade that will enable you to get first class results. So stop reading now and get on with your masterpiece and, if you get stuck, ask an experienced model maker to guide you. Steve Cook (along with Roger Joel) founded Alton Model Railway Group in 1983. Steve has a wide range of modelling interests, ranging from OO Great Western (including building the groups first layout, 'Welles') to Ride on Live Steam Railways, via N Gauge, American Garden Railways, British O Gauge, where Steve is a member of the O Gauge Section.